Material failure can have severe consequences. For this reason, materials and their processing must be tested for their safety, reliability and longevity. Dyne Testing Ltd offers testing equipment from Fischer Instrumentation, a leading specialist in solutions for material testing. The measurement technology of Fischer Instrumentation is sought after and proven when the quality of weld seams is measured in steel constructions or the sealing is determined on anodized facades. This is also true when the coatings are tested on tanks or airplane aluminum structures for fatigue. 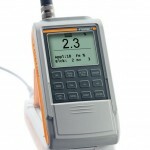 If you want to measure the ferrite content of your material, check the sealing quality of your aluminium weld or measure the conductivity of non-ferromagnetic metals you will find the appropriate instrument in the product portfolio below. This unit is designed for measuring the sealing quality of aluminium according to DIN EN ISO 12373-5 and ASTM B 457-67 standards, designed for on-site testing and can store up to 10,000 measurements. 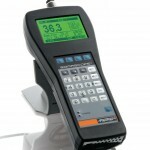 A handheld instrument for conductivity measurement of non-ferromagnetic metals. 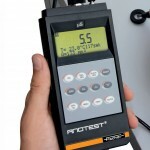 The unit measures the electrical conductivity using the eddy current method according to DIN EN 2004-1 and ASTM E 1004 and features 100 application memories for calibrations.